Why Would Anybody Ever Buy Another Song? The triumph of streaming and digital radio is the third destructive wave for the music industry in the last decade and a half. The Wall Street Journal reported this week that Amazon is angling to join the crowded digital radio market, following Apple iTunes Radio (which followed Spotify Radio, which followed Pandora, and so on). The same week, Apple announced that iTunes Radio has captured 8 percent of the U.S. streaming music market in just one year making it the third biggest digital radio station in America, behind iHeartRadio, owned by Clear Channel, and Pandora. 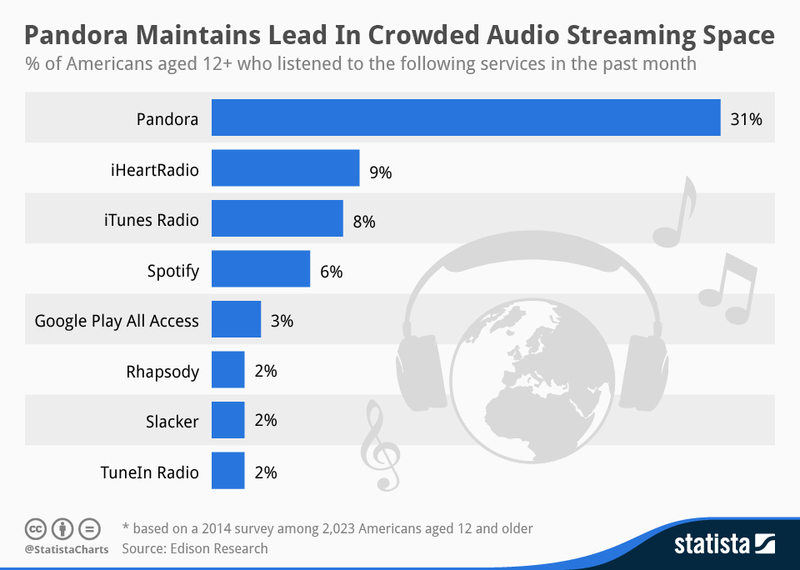 And lest you fear for the future of your favorite online music algorithm, that company announced that listeners and listener-hours are both up over last year, and Pandora now accounts for 9 percent of all U.S. radio listening (including AM and FM channels). If there's enough room in the digital streaming world for a growing Pandora, a growing Apple iTunes, a new Amazon radio, and a new-and-improved Spotify radio powered by their new partnership with the music software company Echo Nest ... what isn't there room for in music? “Young people today don’t buy music anymore,” said Martin Pyykkonen, an analyst at Wedge Partners. The numbers agree. According to Nielsen's annual wrap-up of the music industry, digital music sales fell last year for the first time ever, by 6 percent, as the music business inches closer to an access-over-ownership model. Overall streaming (which includes digital radio) is up 32 percent to 118 billion song streams in 2013. On-demand streaming (e.g. pick and click a song on Spotify) doubled last year. This is at least the third destructive wave for the music industry in the last decade and a half. First, Napster and illegal downloading sites ripped apart the album and distributed song files in a black market that music labels couldn't touch. Second, Apple used the fear and desperation of the record labels to push a $0.99-per-song model on iTunes, which effectively destroyed the bundling power of the album in the eyes of millions of music fans (even though country album sales are still pretty strong). For a decade, music sales plummeted. Third, digital radio and streaming sites got so good that now many music fans wonder why they need to buy albums in the first place. So, they don't. This isn't a music-industry-is-dead! observation, but rather an acknowledgment that, at a time when the television industry has proved to be one of the best businesses in America, the music industry, which produces a simple and easily duplicable product, has had to contend with perhaps the fiercest technological transformation of almost any business out there. A little consumer choice is a dangerous thing.